All four covers are stunning, as expected. The Luke and Rey cover doesn't reveal much--their costumes are essentially the same as what we saw at the end of The Force Awakens. The one (minor) new thing is that we see Luke is wearing that brown glove we see pointing at the old Jedi symbol in the book in the trailer. The most significant reveals on the Finn, Poe, Rose, and BB-8 cover are what Rose's costume looks like from the front and that Poe has a slightly different jacket in The Last Jedi (which, I guess he would have to since he gave Finn his jacket in Episode VII). 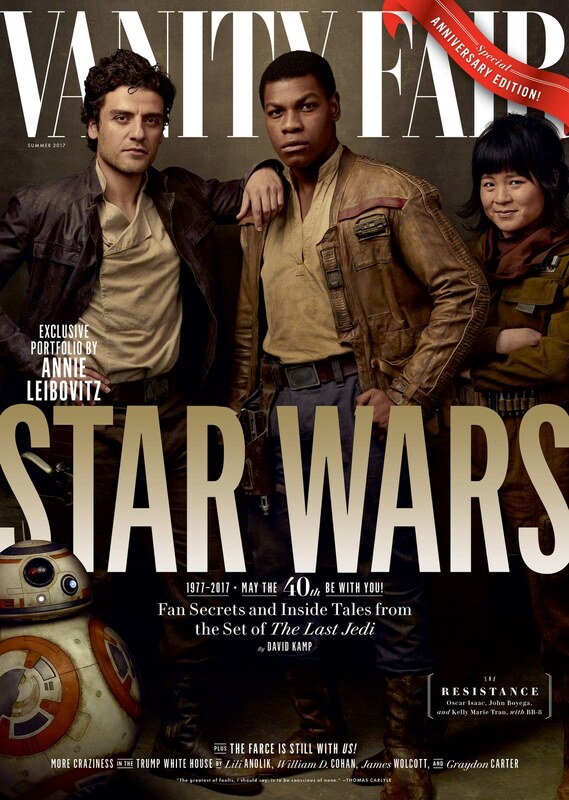 All three, Finn, Poe, and Rose, look very rugged and ready for action in this cover. 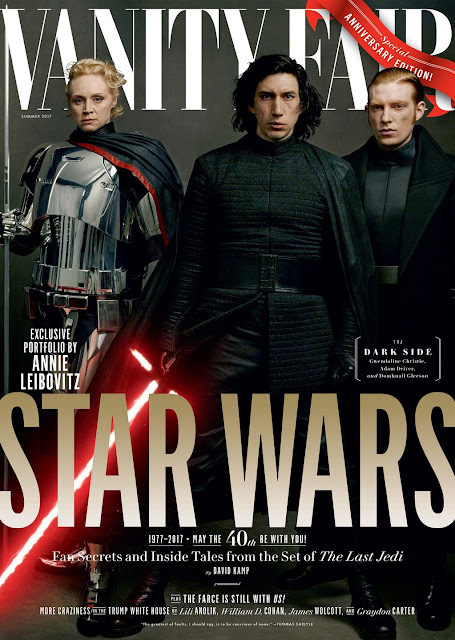 The Kylo, Phasma, and Hux cover is interesting since both Kylo and Phasma are helmetless. Kylo not having his helmet is no real surprise, given that he's not wearing it in either the trailer or the poster (in fact we see it smashed in the trailer). But, Phasma not wearing her helmet is a bit of a surprise. We knew Phasma would be back in The Last Jedi, but there was no guarantee her role would be any bigger or that we would learn anything more about her. There is going to be a big Phasma push in the lead up to the film's release, with both a novel and a comic book miniseries focused on her being released in September, so it looks like Phasma may be taking on a larger role--one like people hoped she would have in The Force Awakens--in The Last Jedi. She also appears to holding the weapon she was rumored to have a while back. Hux, to round out the villainous trio, looks to be wearing more or less the same thing he did in Episode VII. 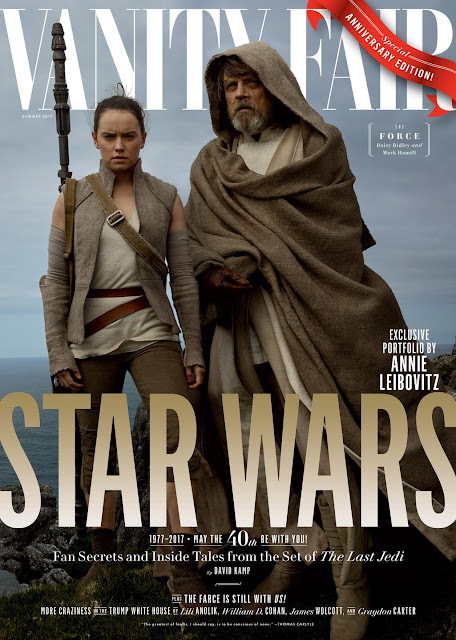 And finally, the General Leia cover shows Leia's new costume for The Last Jedi. It appears to be slightly different from the one she wears in the trailer, though it's possible it's the same costume just without the overcoat. She does appear to be wearing the same jewelry as she did in the behind the scenes photo Oscar Isaac posted following Fisher's death in December. It's also worth noting that this costume feels a lot more somber than some of Leia previous outfits. In previous films, especially the Original Trilogy, she was usually dressed in white or other bright colours--conveying hope. 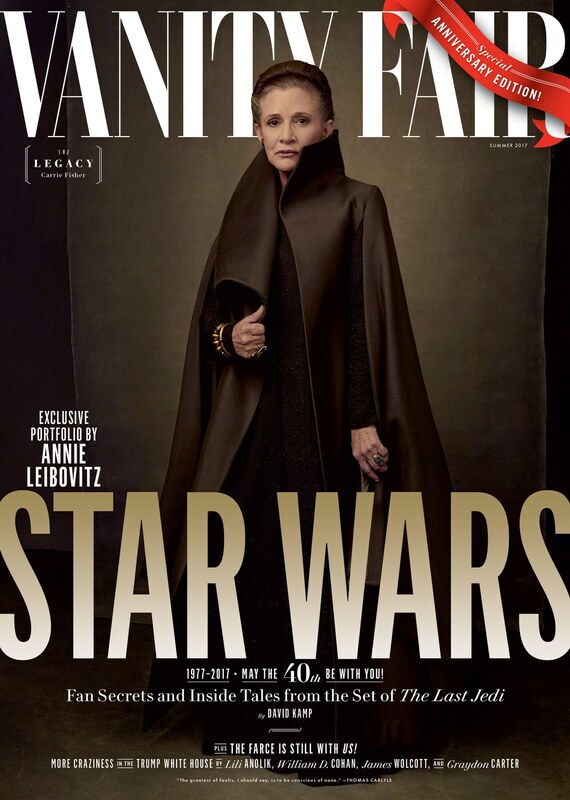 This more somber look may reflect where Leia is in the new film having lost her husband, seen her son fall to the Dark Side, and witnessed the New Republic be destroyed in way similar to that of her home planet Alderaan. Regardless, it's always moving to see the late Carrie Fisher in her final performance as her most famous role. 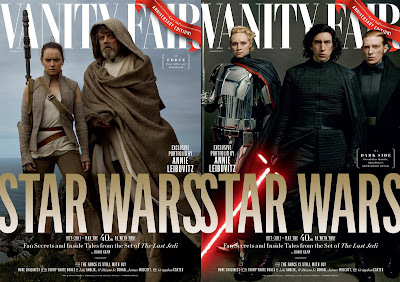 The rest of Leibovitz's photos from The Last Jedi will be released online on Wednesday, and they will be featured alongside a story on the making of The Last Jedi in the Vanity Fair issue that hits shelves in New York and Los Angeles on May 31st, and across the US on June 6th.